While there will always be tragic accidents and forces of nature, we cause most human suffering ourselves. And most of our motivation to do that is driven by one factor: tribalism. Tribalism is the sense of belonging and loyalty to one’s own group of people, plus a sense of otherness and hostility against outsiders. We never wish to harm ourselves, so tribal feelings allow a community to work together for common causes. However, tribalism also divides humans into us and them. By creating “others”, it creates distrust and antagonism. The scientific method is like kryptonite to tribalism. The power that scientific thinking has to reduce tribal tendencies towards violence makes promoting it the most important thing any of us can do to end human suffering. That is an enormous claim, but tribalism is enormously embedded in our psyches. Anyone who follows sports understands tribalism. 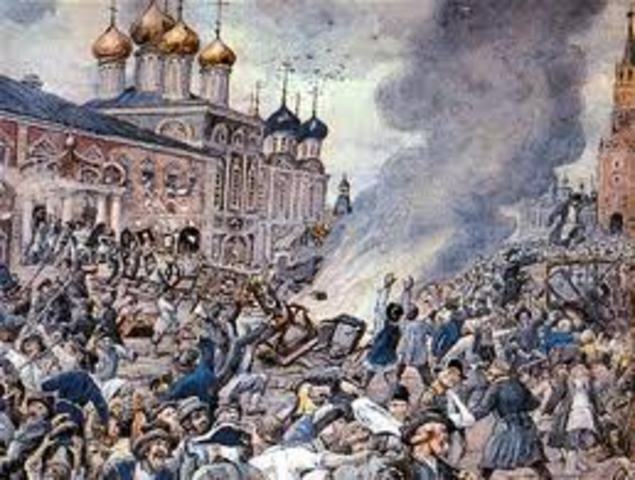 The first recorded sports riots were the Nika Riots in the year 532, in Constantinople, the heart of the Byzantine Empire. Opposing fans at a chariot race burned half the city and killed 30,000 people. 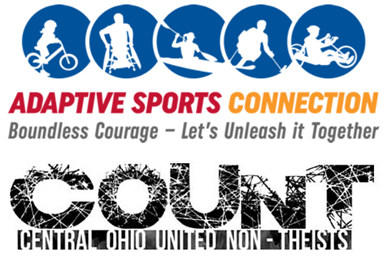 Sports events still lead to violence today. Ostensibly, fans of teams such as the New York Yankees and the Boston Red Sox have much in common because they love the same sport. Players on American baseball teams are drafted from all across the country, so they don’t even represent the cities that they play for. But team loyalty can arise from almost nothing, conjured from thin air. The Rwandan genocide of 1994, which killed a million people, can be directly traced to racial divisions that were completely fabricated. Belgian colonists created false Hutu and Tutsi racial distinctions to divide and control the population, and it worked. Those placed in “their own groups” embraced the distinctions. Humans love to rush into tribalism. It is wired deep into our nature. Tribal affiliations have brought benefits and consequences to us since before modern humans separated from Neanderthals. Genetic pressures cause us to protect our family from harm, thus protecting our own genes and cultural values. Extending that to an entire tribe, we feel we must guard the people who are similar to us, and defend against strangers. 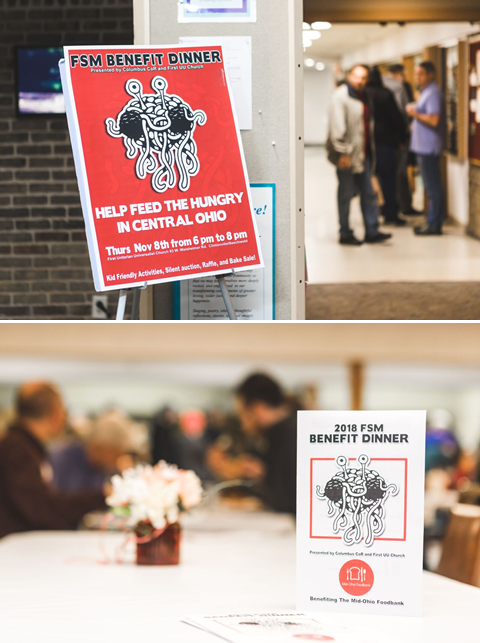 By banding together, local populations have strength in numbers. This strength comes at the cost of hostility and violence towards people outside our tribe, best illustrated by the schoolroom staple, “Lord of the Flies”, by William Golding. The book is an allegory about the inevitability of tribalism and war. During World War II, a group of schoolboys is evacuated from a war zone by a plane that crash lands on an uninhabited island, killing all the adults. With no controlling influence, the boys break into two groups with murderous intent. The children’s savagery, the book implies, is hardly worse than how adults of the world are behaving, fighting their savage world war. 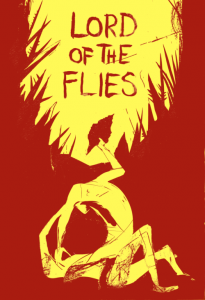 You are almost certainly familiar with Lord of the Flies, but did you know that in the year it was published, 1954, that this scenario was played out in real life, with two summer camps of boys nearly murdering each other? Psychologists had a lot more power in the 1950s to unethically mess with children, performing experiments that would never be approved today. 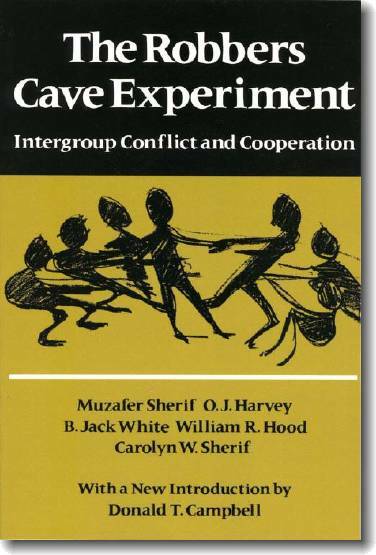 One infamous experiment that should never have gone forward, the Robbers Cave Experiment, was the brainchild of Muzafer and Carolyn Sherif, two of the founders of modern social psychology, and authors of The Robbers Cave Experiment: Intergroup Conflict and Cooperation (1954). They interviewed a series of 12-year-old boys, selecting twenty-two who seemed physically and psychologically normal. The boys didn’t know one another, and had all been raised in average, mainstream families with two parents. 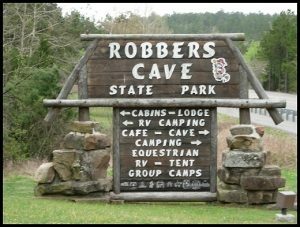 The psychologists divided the boys into two groups and transported them separately to opposite ends of a 200-acre Boy Scout Camp, Robbers Cave State Park in Oklahoma. The purpose of the experiment was place the two groups under competitive stress and see whether they would self-organize into tribes, and especially what would happen when the two groups living only a half mile apart discovered each other. None of the boys were aware that they part of an experiment. None of the scientists knew that their well-planned study would self-destruct in less than two weeks. Although the scientists didn’t want to affect the experiment, they needed to observe and take notes, so they posed as camp counselors. However they tried as much as possible to avoid giving the boys any suggestion or structure about how to behave. Instead, in the first week, the experimenters kept the two groups separate and fostered tribalism by giving each camp of boys problems that required cooperation. Without any direction as to how accomplish these goals, the boys were required to cook meals, pitch tents, and dig a latrine. One group named itself the Rattlers and the other named itself the Eagles. The boys assembled themselves into hierarchies through taunting and insulting each other over any perceived weakness. Where each boy ranked socially was a measure of how “tough” has was perceived to be. Competition in the social order dominated everything, for example causing boys who had injuries to disguise them rather than seek medical care. Boys who seemed weak were showered with verbal and physical abuse. This being the 1950s, the experimenters simply allowed this to happen. And they were about to give the boys knives. In the second week, the groups were allowed to come into contact. 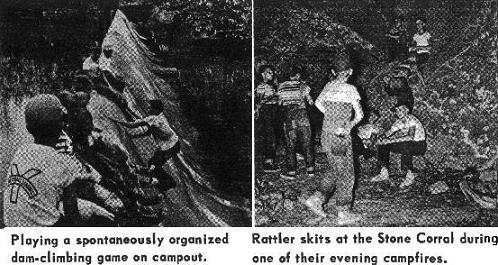 The camp counselors of the Rattlers led them through the forest to within hearing distance of the Eagles, who were playing baseball on a diamond field they had constructed on their half of the Boy Scout Camp. The Rattlers were immediately jealous and ran the Eagles off the field, claiming it for themselves, and then worked the next day to further construct and improve it, cementing their “ownership” of the site. The Rattlers and Eagles immediately wanted to challenge each other, which the scientists had expected and were hoping for. So the camp counselors ran competitive tugs-of-war, baseball games, and treasure hunts that were secretly manipulated to generate friction between the groups. The losers of each contest were deliberately humiliated, and the winners were given medals and yes, knives. Owning knives was a big deal to woodsy boys who lived 30 years before videogames. Now the children had tribal weapons and symbols of pride. Each tribe even created flags and planted them to mark their territories. 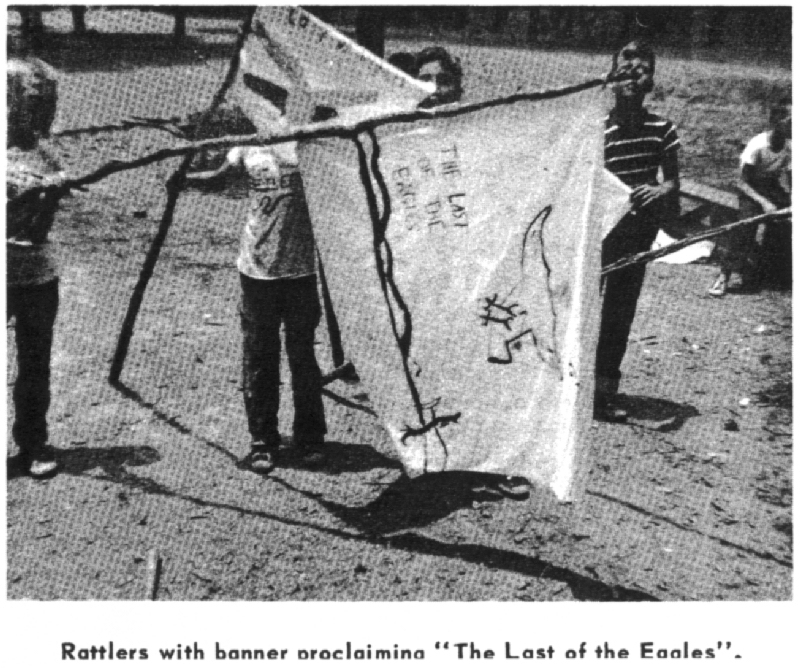 One Rattlers flag held the phrase, “The Last of the Eagles”, a stone’s throw from modern Iran’s “Death to America”. It took only days of the scientists pushing the boys’ buttons and fueling conflict for the confrontation, which had begun with verbal abuse and physical threats, to turn to actual violence. Name calling became destruction when the Eagles stole and burned the Rattlers’ flag. Rather than putting a brake on the situation, the Sherifs, to judge from the book they wrote afterwards, were delighted. 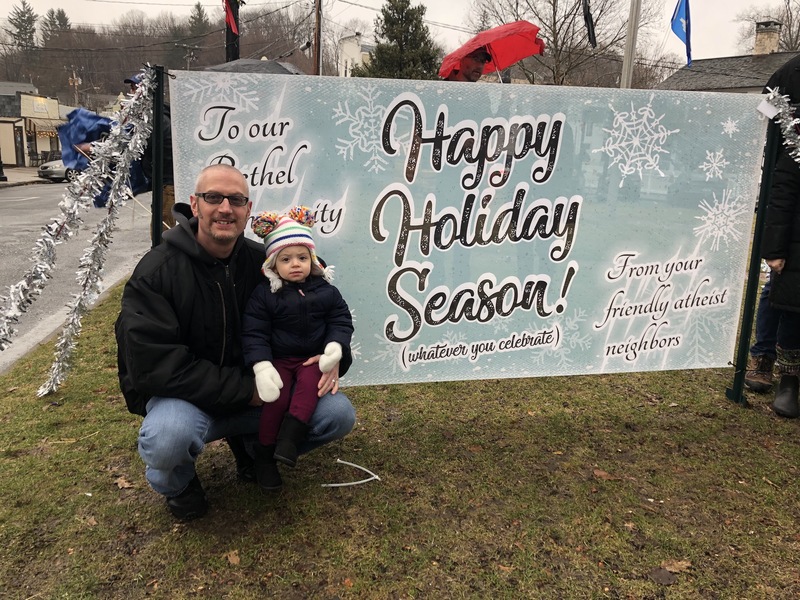 “This flag-burning episode,” they wrote, “started a chain of events that made it unnecessary for the experimenters to introduce special situations of mutual frustration for the two groups.” In other words, their campground was rocketing out of control. Flag stealing escalated into fist fights. Then the Rattlers put on war paint and raided the Eagles’ cabin in their absence, stealing comic books, turning the beds over, and ripping the mosquito screens. In retaliation, while the Rattlers were in the mess hall, the Eagles brought sticks and bats to raid the Rattlers’ cabin, destroying everything. These attacks were celebrated with delusional thinking that inflated each victory into proof of superiority and explained away any defeat. The groups made up insulting songs to taunt each other, triggering the next wave of attacks. Further raids came with new weapons, made from stuffing rocks into socks, which reached a peak when the Rattlers stole the Eagles’ hard won knives and medals. This symbolic offense that caused shame and shook the Eagles’ self-identities, driving them to an even higher level of frenzy. The conflict became so violent that even the Sherifs saw murder in the eyes of the children and broke up the fighting. The experiment had been both a terrible failure and a terrible success. At that point, the boys should have been sent home, but because this was the 1950s, the scientists began a new experiment instead. 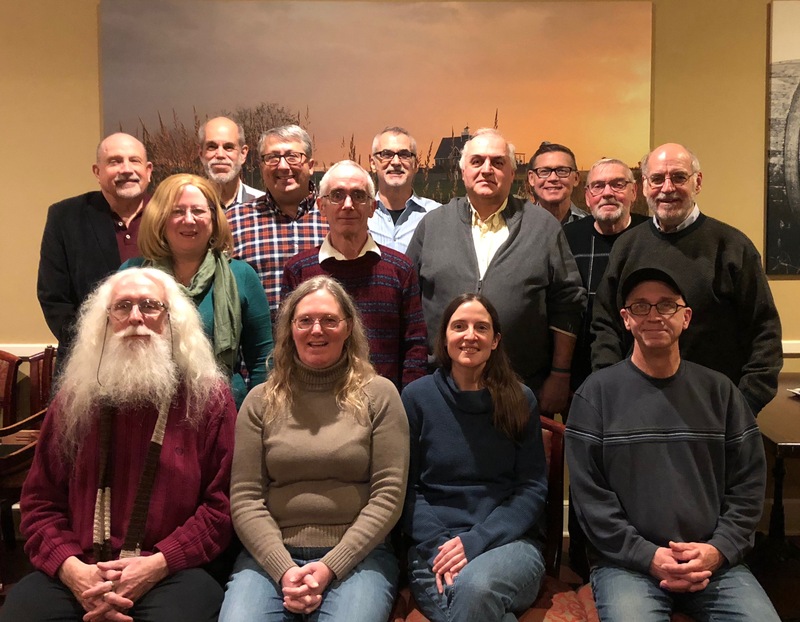 To see whether they could reverse tribalism, they pressured the two groups to work together by creating a problem that would require cooperation. They cut off the boys’ drinking water. It is hard to belief that there is no bias in the upbeat book that Muzafer and Carolyn Sherif wrote about their summer, but according to their report, in the third and final week of camp, the boys came together and bonded. They all left with interesting things to say about how they’d spent their summer, and possibly a need for a lifetime of therapy. In modern times we are already seeing less tribalism. Barriers between humans have eroded, and violence is at an all-time low, despite the growing efficiency of our weapons, as shown by Stephen Pinker in The Better Angels of Our Nature: Why Violence Has Declined. Today, the people who die each year, as a fraction of the population, as a result of murder or war, is lower than at any other time in our history or prehistory. In ancient times, tribal boundaries were set by local factors, the racial, cultural, and national identities of populations. Religion didn’t shift or increase tribal boundaries that much because religion was also localized. Just as travelers would speak the local language wherever they went, they would worship the local gods in each city they visited. Arriving in the upper half of ancient Mesopotamia, you would worship Ashur, the national god of Assyria. Traveling to Persia, you would worship Ahura Mazda, the creator and god of light. define larger and larger tribes that could come into larger and larger conflicts. Religiously motivated violence that had previously been capped to conflict within a tribe, such as between families, began instead to drive conflict between groups of tribes and entire societies. influencing the immigration debate in the United States, but governments cannot call upon race openly. Nationalism causes tribalism, because nations have long histories, connecting modern citizens to real or fabricated injustices of the distant past. It is always ominous when a military man with a beret and thick mustache gives a speech about “taking back” a territory. Fortunately, in modern times, member states of the United Nations must accept that nations are sovereign, with the right to manage their own people. Imperialism has gone out of fashion. In the past, victors would simply take over the losing side’s country. Today, wars between states topple governments but less frequently redraw national boundaries. 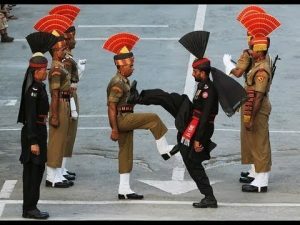 Display of strength at India-Pakistan border crossing is a daily tribal ceremony preferable to war. damned to hell. Most religions seek to convert outsiders to their faith. Religions promote blind faith as a virtue, which makes it more likely for their “flock of sheep” to follow authority instead of thinking for themselves. This gives more power to the leaders of religious organizations if they wish to create conflict. often leads to conflict, as we try to silence the voices that cause us great distress. Shut up, shut up, shut up! Religion makes other tribes seem like a threat to our basic way of life. In addition to creating conflict, religious ideas are simultaneously hard to resolve. 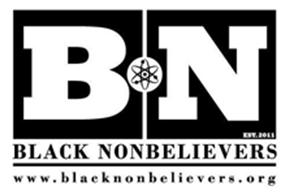 Claims of racial superiority can be disproven. For example, the 1936 Olympics were held in Berlin, where the Nazis wanted to use the games to show off their Aryan superiority. 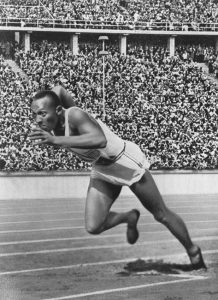 The opposite happened when so many medals were won by American track star Jesse Owens, and other African American athletes. Dissimilarly, many religious claims are axiomatic, unprovable. There is no way to resolve them. Secularism is the answer. We don’t need the kind of secularism that browbeats our religious friends to give up religion. We just need the secularism to encourage evidence-based thinking in shared decision-making, and to raise enough doubt about belief that mutual respect between different peoples is possible. This will reduce the tribalism that causes so much friction in the world. For more on the Robbers Cave Experiment, check out this Scientific American article. Johnny Monsarrat is the creator of Soulburners, a Guinness World Record atheist art project. Find him on LinkedIn.